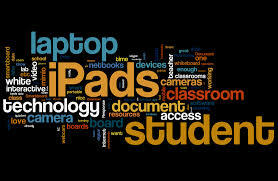 Technology has revolutionised the schooling experience in a countless number of ways. Remember the days of the good old slate chalk board and haggard, tired old teacher droning on monotonously at the front of the classroom? No? Sound completely unfamiliar and rather scary to you? Let’s take a trip down memory lane to the days when your parents and grandparents attended school, and compare the teaching methods used then to the mind blowing ones we have at our disposal today. Back in the day kids had one teacher for everything as they sat in the same seat for hours on end taking notes off the chalk board. Nowadays, classrooms are equipped with white electronic boards that have images and information zooming across the screen at the click of a button. Students are interacting now as they are encouraged to participate and work with the technologybeing used during the lesson. No matter what interesting and new apparatus you are using, kids know what it is and how it works even before their teachers do. Many years ago, students were given a certain amount of information that had been passed on for generations and that was what they had to study. It was pretty much A, B and C, period. The advantage that students have now is global, not local. Not confined, but defined by the fact that information is endless and there are no boundaries to what children can open their minds to. No longer will Suzy suffer from back problems when she grows older as she now has a nifty little thing called an I-Pad. Long gone are the days of lugging around heavy books from classroom to classroom as students today make use of interactive technology such as Tablets during class. Lessons are preloaded within minutes onto Tablets via Apps and there you go. You are off on your way to an incredibly advanced education, without the fear of becoming a hunchback. With options such as voice recognition technology software, there are far less hurdles for kids with special needs at school. Kids with speech or learning disabilities were not able to interact as much within the class environment, but with the remarkable advancements made in technology today, there is no need for distinction. Education is digital and for all. The only thing more remarkable than the pace at which technology has improved the learning experience, is the creative outlet that kids have at their disposal. The good old fashioned poster board project is a thing of the past as students can create digital presentations, print 3D models of their science experiments and start an interactive online Twitter account to further expand their passions and ideas. No matter what kids are dreaming up, there are tools out there to make it happen. The classroom experience is enriching the lives of both students and teachers as new methods are constantly popping up to enhance the youths’ education. The beauty in this is that while technology is continuously evolving, so are the minds of our students.